Um mal ein kurzes Update zum aktuellen Stand der Dinge zu bringen - kürzlich wurde die zweite Beta von SMF 2.0 veröffentlicht. Simple Machines is pleased to announce that the second beta of SMF 2.0 has been released to our Charter Members. This release marks an important step for SMF 2.0. After five months of bug quashing, feature development and a general clean-up we are now much closer to a public beta release. SMF 2.0 is now, in the most part, feature frozen and we are aiming to allow the public to participate in the next beta. We're going to be doing our best to have a much more frequent release cycle now as we move towards release candidate stage, but we have some important template changes prior to in the next beta. As well as the general improvements in Beta 2 we've also reengineered the database security model within SMF which we believe should offer users greater protection against malicous attacks - you can read more about this here. 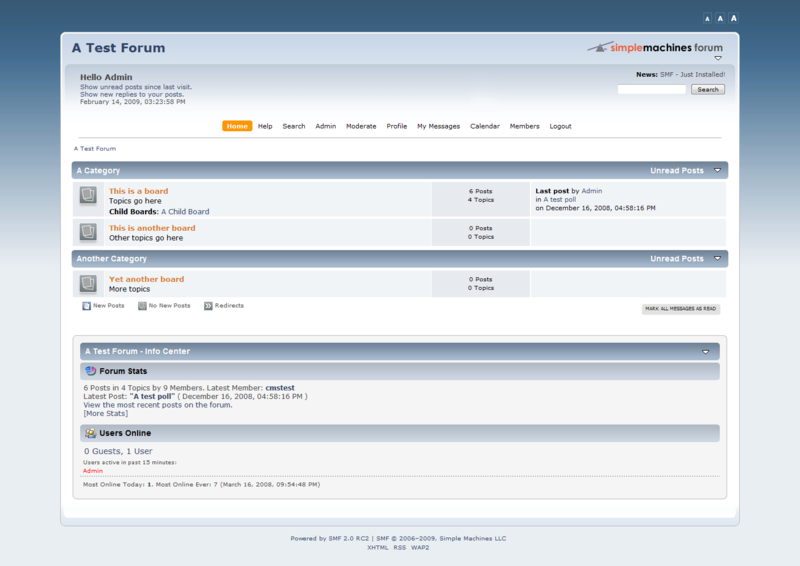 * Added mass topic mover to the maintenance section, and changed the maintenance area templates. Wie auch schon die erste Beta ist die Beta2 nur für Charter Members verfügbar (Leute, die einen Jahresbeitrag für z.B. besseren/direkten Support an SMF zahlen und dafür auch neue Versionen früher bekommen). D.h. für uns erstmal nicht wirklich relevant. Man sieht aber schön, dass die Entwicklung voran geht, und die Beta3 soll dann so wie es aussieht die erste öffentliche Testversion werden - dann wird der Zeitpunkt kommen, um intern schon mal ein bisschen damit zu experimentieren, vielleicht mit Templatedesign anzufangen etc. 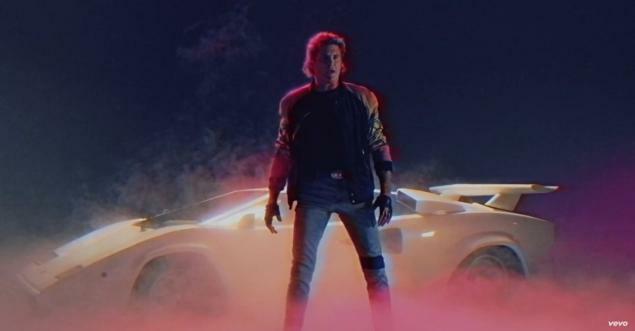 Nach der dritten Beta sollen dann, wenn ich mich richtig erinnere, noch ein oder zwei Releasekandidaten kommen bevor die finale Version erscheint. Es kann also gut und gerne noch Monate dauern, aber es geht voran. Simple Machines are proud to annouce that today, 25th August 2007, the first beta release of SMF 2.0 is in the hands of our Charter Members. This beta release marks a significant milestone for us, and is the culmination of over eighteen months of discussion, coding and testing since work began in January 2006. We expect it will be quite a few months more before we're ready to release the first public beta but in the mean time feel free to check out Introducing SMF 2.0 for a taste of things to come. You can find out more information about the Charter Member program here. * Database abstraction - with support for PostgreSQL and SQLite planned alongside that of MySQL. * Automatic installation of packages into themes other than just the default. 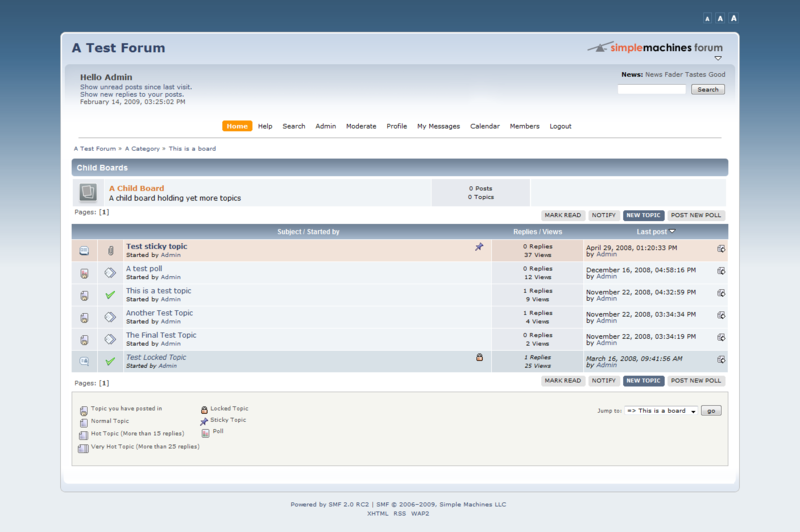 * Email templates to simplify customization of forum emails. * Moderation center including post, topic and attachment moderation - to allow approving of user content before it is made public. * Additional group functionally including group moderators and requestable/free assignable groups. * WYSIWYG editor to provide an intuitive user interface to those users not familiar with BBC. * Permission improvements such as group inheritance and permission profiles to further reduce the complexity of the permissions system. * File based caching for a performance increase on all forums regardless of whether an accelerator is installed. 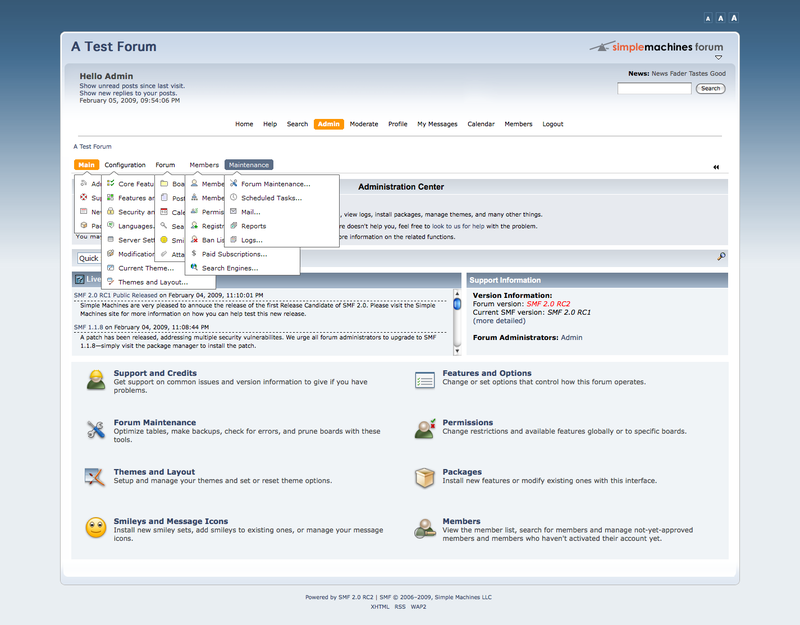 * Mail queuing system to stagger the sending of emails to improve performance on large forums. 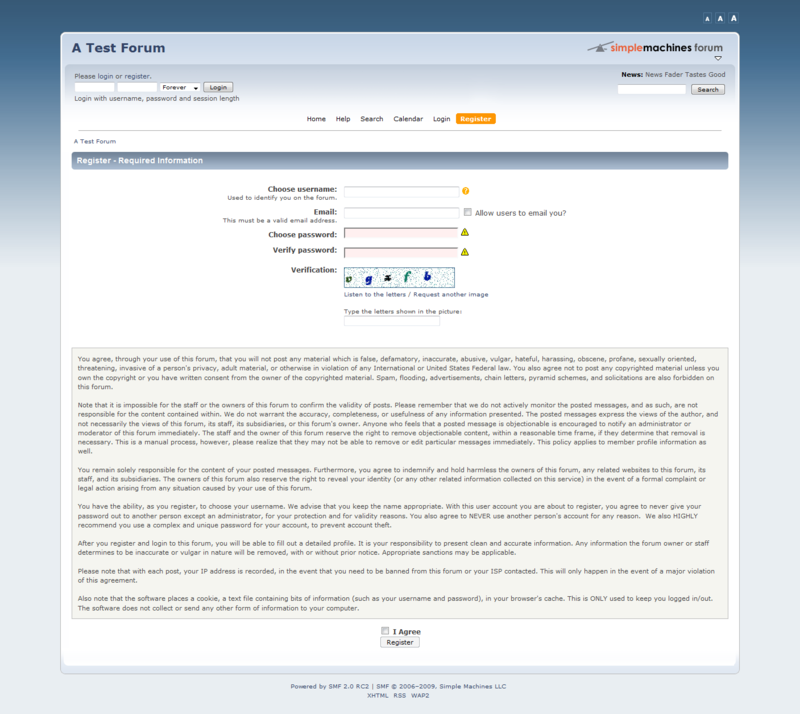 * Advanced signature settings to allow the administrator of a forum to more tightly control the contents of users signatures. * Personal messaging improvements including ability to automatically sort incoming messages and a variety of display options. * Improved upgrade script with better timeout protection and simpler user interface. 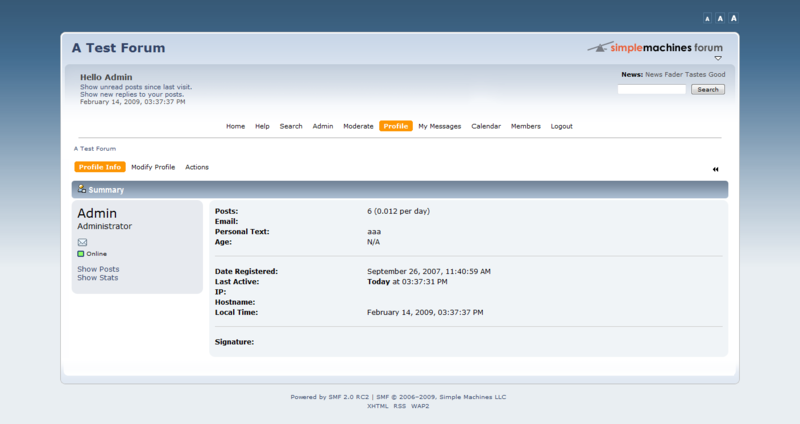 * Custom profile fields to enable administrators to add additional member fields from the administration center. 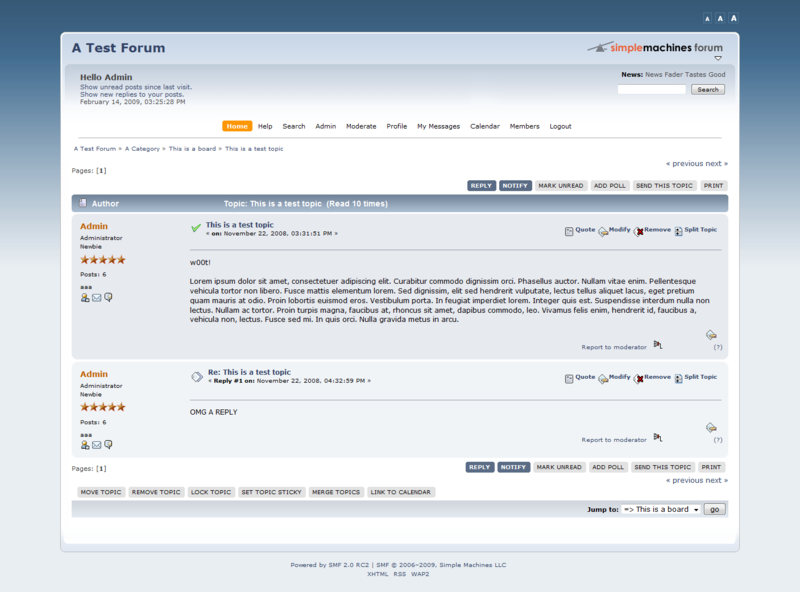 * User configurable posts and topics per page; an improved calendar interface. * Option to allow guests to vote in polls. Lasst euch nicht von den fünf Monaten abschrecken, die zwischen den beiden Betas lagen. Ab der aktuellen Beta ist die Version im Feature-Freeze, d.h. es kommt nichts neues mehr hinzu, sondern es werden nur noch Bugs gefixt und die Stabilität wird verbessert, also sollte von nun an alles etwas schneller voran gehen. Joomla 1.5 Stable ist vorgestern im Goldstatus! Nach so langer Zeit endlich ein Release! Ich werde meine laufenden Großprojekte und meine Klausuren abschliessen, im Anschluß können Bloody und ich unsere Köpfe zusammentun und hier was richtig Feines auf die beine stellen. Die erste große Aufgabe wird denk ich sein ne vernünftige Bridge zwischen Forum und CMS zu basteln. Simple Machines is extremely proud to announce the long awaited release of the first public beta of SMF 2.0. SMF 2.0 has now been in development for over 18 months, and in beta with our Charter Members since August last year. Feature complete, and having undergone considerable testing and bug fixing, we are now ready to put it into the hands of the public for wider testing. Importantly, this is a beta - and the first public beta at that. We strongly recommend that you do not use this package on a production site as it will contain bugs and issues. In addition whilst we'll do our best to support people running the beta our support team's primary focus will remain 1.1 during this period - so please be patient if you do experience a problem. Also, we request you note the following caveats: All existing mods and themes are almost certain not to work until their authors have an opportunity to rewrite them. The upgrader will do its best to upgrade previously installed themes. However, this is not fool proof and you are likely to need to tweak old themes and update them to take full advantage of SMF 2.0 functionality. Language packs for 1.1 will be out of date and need updating - this might take some time. Users who currently integrate SMF into their site using any of the non-standard SSI functions (Such as using the db_query function) will need to change their integrations to use the new query system in 2.0. More information on this can be found here. Post and attachment moderation - setup through board permissions. The download packages are the same as for 1.1 - simply choose the install or upgrade package depending on your requirements. If upgrading please, please remember to backup first. Please do not use this topic for support questions - use the dedicated 2.0 Support Board. Guides for installing and upgrading can be found on the Online Manual. Note that downgrading is not possible. On a quick note to mod and theme authors, we are currently working through the templates to move towards more semantic HTML layout. Unfortunately we didn't complete this in time for this beta, but this will make the next release, so please bear this future change in mind when looking at updating your mods and themes. Finally, we thank you for your patience and hope you enjoy using this software as much as we have enjoyed making it. The Simple Machines Community Forum Team. Die SMF 2.0 Beta 3 ist draussen, und sie ist öffentlich! Aber auch ein paar sinnvolle Features. cool, vll mal was Neues? Ich hab zwar jetzt die Beta noch nicht ausprobiert, aber ich gehe davon aus dass das neue Default-Theme so ähnlich aussehen wird. Ich kann und werde das aktuelle Theme nicht 1:1 übernehmen. Ich werde das neue default Theme als Grundlage nehmen und ungefähr an unsere aktuelle Farbgestaltung anpassen. So dass wir von Form und Layout her quasi 1:1 den Standard nutzen, aber mit anderen Farben, Symbolen und Logos. Mit etwas Glück und Geschick geht das mit Änderungen allein auf der CSS-Ebene. Lange ist es her... um mal wieder was zum Thema zu sagen. Die Sache zieht sich ja nun wirklich in die Länge, aber es macht Fortschritte. Mittlerweile gibt es den ersten RC für SMF 2.0, und der zweite steht schon in den Startlöchern. Das ganze ist recht semantisch gestaltet, so dass es sehr viel einfacher werden wird das Theme selbst zu verändern. Man kann schon allein über CSS sehr vieles schnell umstellen, finde ich soweit sehr gut. Das löst viele Probleme. Schaut doch recht schick aus. Und vor allem --> einfacher anzupassen, das ist ja der wichtigste Punkt. Dem Oli fehlen halt die Breireifen, Rallystreifen, der Spoiler und der Kennwood Aufkleber. Billabong ist ein kleines Nest mitten in der Wüste Nevadas. Nur dort werden die typischen Hamster mit Nachbrenner gezüchtet... kennste nicht ? Also ich weiß was Oli meint, stimme aber nicht zu: es sieht zwar schlicht aus, aber die Buttons und wie das alles eben aussieht sieht viel dynamischer nach AJAX aus, was mich irgendwie dazu verleitet die Software als...aktiver...mmh, schwer zu beschreiben...wenn ich sagen web2.0iger steigt mir der Akos, wenn er mal wieder auftaucht ja wieder aufs Dach.